Hi I am Sarah and along with my husband Blake and our son, Grant we welcome you to Grant's Gifts! Thank you so much for stopping by! Grant's Gifts is an organization we created that is very near and dear to our hearts and our family. Before our son was born we had very little knowledge of the NICU and what being in the NICU encompassed. That all changed in September 2016. On September 16th, 2016 I was 30 weeks and was at the airport picking up my friend who had flown in for our baby shower that was being held that weekend. As soon as I stood up out of the car I felt as though I was peeing my pants. I started laughing and said to my friend 'I am really sorry but I just peed my pants'. We had a good laugh about it and continued on our way. The whole drive I felt like I was still 'peeing' but kept thinking it was part of pregnancy. Throughout the afternoon/evening I started to feel a little off and some back pain. Again, I didn't think too much of it. This was my first pregnancy and I didn't know any different. I hardly slept a wink that night between the intense back pain and googling everything under the sun. I still felt 'off' that morning when we got up. I laid on the couch and slightly kept an eye on the clock noticing that every 10 minutes or so the back pain would come again. We called the on call doctor and told him what was going on ('peeing' my pants, pain, general concern). He was not overly concerned (major side eye) but told us to come in if we felt it was necessary to get checked out. We headed to the hospital to get checked out. Before we walked out the door my husband said 'do you want to take your dress for the shower?' and I breezily said 'nah, we will be back in time to change before the shower'. Turns out we weren't. Once being checked out, hooked up to machines (that weren't acknowledging my contractions because they were all back labor) and being tested for leaking amniotic fluid our world went from 0 to 100 very quickly. Once it was determined that, in fact, I did not pee my pants, my water had definitely broken. The doctor determined that I only had 25% of my fluid left. At this point we were told I would be transferred to a different hospital where I would stay for at least 4 weeks until I was 34 weeks along. I was 1cm when I left the first hospital. By the time I arrived at the second hospital I was at 3cm and was in so much pain I could barely speak. Thankfully they gave me an epidural pretty quickly and that helped tremendously. Back labor is no joke. Because it was our shower weekend almost all of my girlfriends were in town. They came to my room and helped distract us from the craziness the past few hours had brought. When the doctors checked me again about an hour later I was at 8cm. They quickly said 'you guys are going to have a baby today!' As imagined, all of the details here were fuzzy but I do remember them mentioning the NICU. They told us that they would take Grant once he was born, wrap him in the plastic to keep warm and then he would be off to the NICU. I can't say that I fully or even paritally processed anything that they were saying. They transformed our room into a birthing space in a blink of an eye. The next 25ish minutes are a complete blur but thankfully my labor wasn't too terribly lon long and soon enough Grant was here! 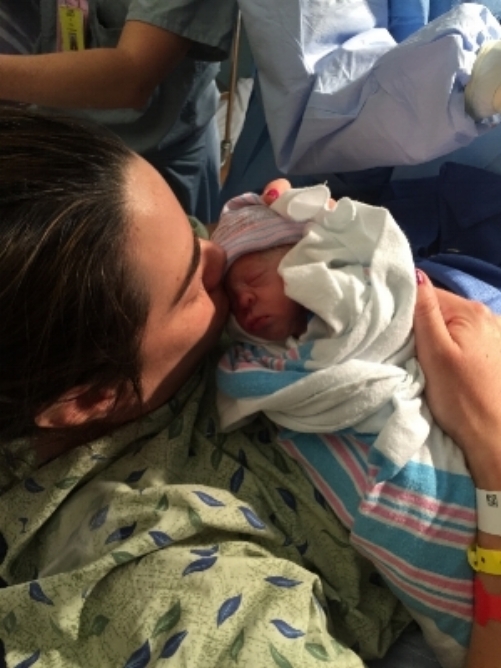 We were incredibly thankful and shocked to learn his APGAR was a 9! Because of that, after he went under the warmer for a few minutes he was doing well enough that they let us hold him for a short time. Those few minutes were unforgettable. But as soon as they happened, they were gone and he was off to the NICU. I honestly am not entirely sure what happened after that but I know he was in amazing hands down in the NICU. From there we were thrown into the world of the NICU. The beeps, the tones, the rounds, the checks, the feedings, all of it. We had literally no idea what to expect or what our world was about to develop into but we quickly stumbled along and started to grasp things as went.. 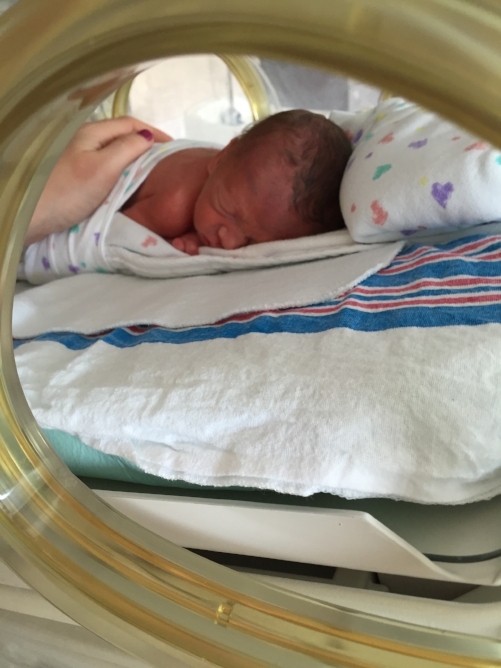 The doctors and nurses at our hospital were incredible at making us feel comfortable and at home in the NICU. The NICU left an incredible impact on our family and our lives. Because of this we are extremely passionate about Grant's Gifts and helping fellow NICU families. We are passionate about getting preemie clothes into the hands of graduate families when they leave the NICU. Preemie clothes can be difficult to find and we know firsthand, once you are looking for preemie clothes, you usually need them right away. We want to take that burden off families and help make their transition home a little sweeter. We want families to have an outfit for picture day, for going home and for welcoming friends and family at their homes with their bundle of joy.